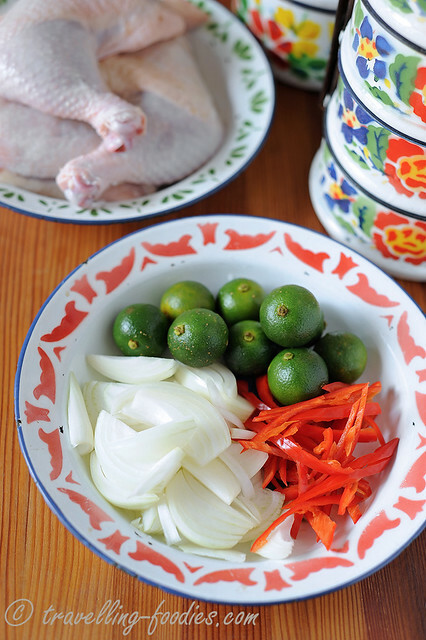 We love to cook this at home because there are many variations which one can prepare depending on what is available in the pantry, be it the “Ayam Tempra” form with chicken, “Ikan Tempa” with fried fish or even “Telor Tempra” with beautifully crisped sunnyside ups, using just a few ingredients. I’m sure the moreish tasting sauce would be absolutely delish when drizzled over crispy deep fried pork chops which had been coated with soda cream cracker crumbs, not unlike how Hainanese Pork Chops are prepared. “Babi Tempra“, not quite an authentically Peranakan rendition but no less yummy I’m sure. 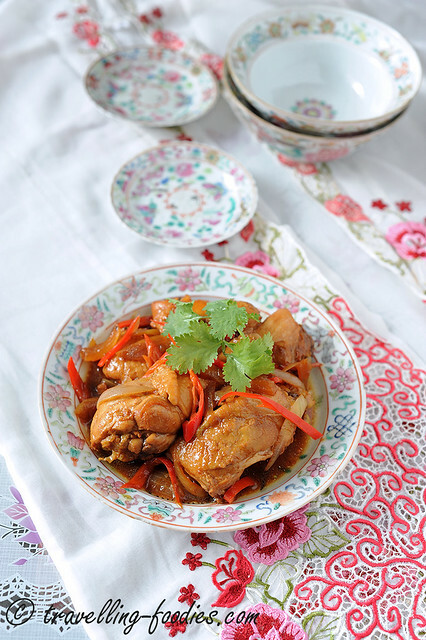 We love to cook this dish with drumsticks which had been chopped down to smaller chunks. Usually two whole drumsticks with thigh are more than even for a small family, but feel free to use drumlets or chicken wings instead. If drumsticks are used, do ensure that they are chopped down to uniformly sized chunks for more even cooking time. 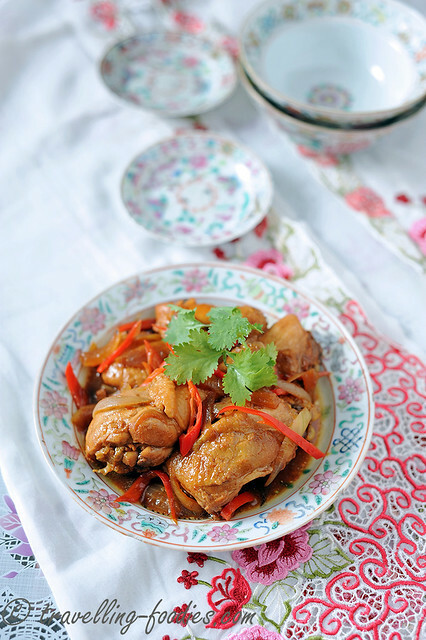 Apart from chicken, this dish calls for very few other ingredients but each one of them are really important to bring out all the piquant flavours. I do know some folks who cook it with vinegar for the sourish note but we prefer to use calamansi instead for that fruity tang. Onions are sweated first for their sweetness and it doesn’t really matter if white, yellow or purple onions are used. All of them work equally well. Chilies are added for a hint of spiciness as well as contrast with its vibrant colours, all aimed at whetting the appetite both visually and in flavour. 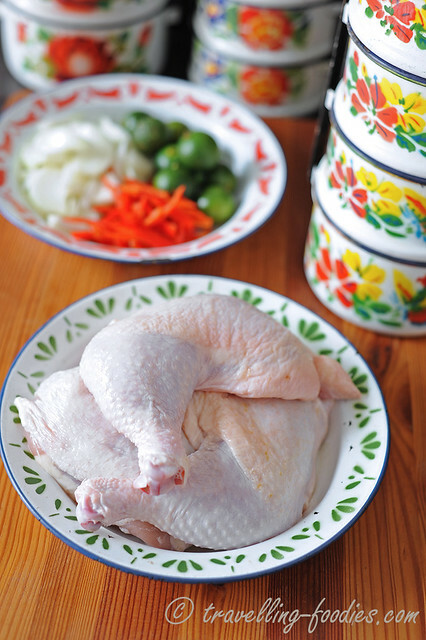 To a heated wok, add cooking oil and pan fry chicken chunks until the skin begins to brown slightly and crisps up. Dish and set aside. 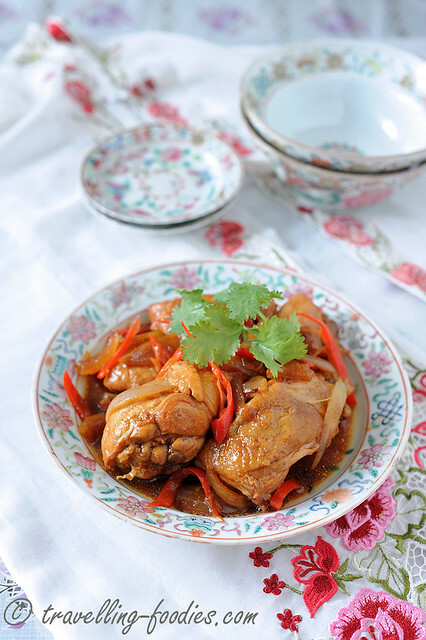 Return chicken chunks to the pan and add sliced red chilies, dark soya sauce, calamansi juice, sugar, salt and stir fry until the chicken are uniformly coated with dark soya sauce. Add hot water and bring everything to a boil before lowering flame to simmer for 2-3 min with lid covered. Taste and adjust with more salt, sugar or calamnsai juice if necessary. Stir fry for 1/2 min or so to concentrate the juice slightly and dish up. This entry was posted on September 16, 2014 by Alan (travellingfoodies). It was filed under Food, Simple Eats and was tagged with Ayam Tempra, Baba, bawang besar, bawang beseir, calamansi, cili merah, Nyonya, Peranakan, red chili, sour and spicy chicken, straits chinese.